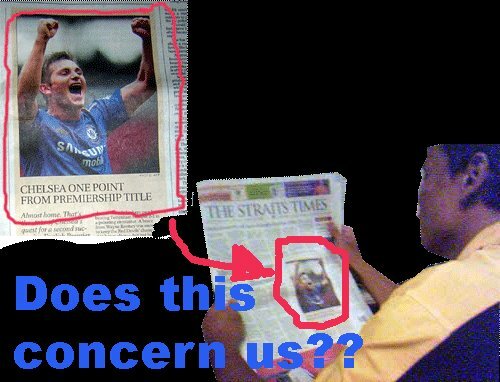 BoLASEPaKO.com - a simple view on Singapore Soccer: Xenophobia am I?? Happen to pick up a copy of the Straits Times today. Saw an unpretty sight when I noticed the picture of Chelsea's midfielder Frank Lampard on the frontpage of the national broadsheet. One question came to my mind - Does this concern us? I don't blame you guys for thinking that but to have this piece of news placed on this national broadcast must be something that is not appropriate as once again had made us look as if we are living in the past (as a British colony), with the news of who going to be crowned as the EPL champions being something that is utmost important.